WOW! that snow and cold looks vicious. I live in SAfrica, Pta, so we don't see snow. It's 36C here now. Love those little Christmas mice. Yes, it is cold - even for here. My kitchen thermometer claimed it was -1.1 degrees outside this morning. Thank God for a furnace guy's next-day availability and our fortunate-ness to fix our furnace. Our blower motor went out yesterday or the day before. We are also fortunate that the finished breezeway/family room has baseboards, that kept our home to a toasty 60 degrees through the night. More clothes, socks, and extra blankets were just fine. 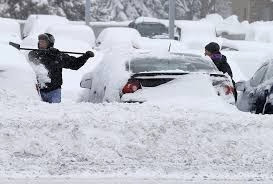 I can't imagine those who cannot afford heat or shelter this time of year. One night and we are more than fine. Those snowflakes are awesome! I had to take a second look to even realize they were star wars based. Yes, we are having cold weather and a bit of snow up here now, too! Thanks for sharing all that random goodness. But that last pic........ Poor Santa! What fun to make cute little mice cookies with your grandkiddos! I would say it is cold here in Charlotte, NC! There is frost on the ground. Being a former northener this is nothing compared to Ohio weather where there is snow on the ground. Not as much as in MN though! LOL! Enjoyed seeing the images of the kiddos enjoying tasting and making Christmas mice! Hmmm, now I will have to watch for sightings of two things: sewing machines at sporting events and Sanata-zon. :) I have linked up for the first time today. Thank you hosting your party! We had that cold weather this far south too. Where is my midwest coat when I need it? This is such a fun time of the year with the little ones, They look like they are having so much fun. I loved the snowflakes! That video was so funny. I had to share it with several people. We are always laughing about "storm watch" on channel 7 here. Gotta love California "winter". Ha! That game was on TV when my family was watching (I don't get into football), but I came into the room so they could replay it for me. I did a little research and think I figured out that was a Brother sewing machine on the sidelines. Too danged funny, especially seeing a man making that repair. (Sorry, I'm sexist like that.) Enjoyed those Star Wars snowflakes, and I'm not even a SW fan. Your randomness is always fun, Cindy. love the video and all the fun randomness. We hit minus 3 yesterday - brrrr! It's bizarrely warm here, like 13-14 C, which is kind of early summer temps here! I love your random Thursdays! It makes my week. Thank you Cindy. Love the cherry mice cookies what a fun way to spend an afternoon. 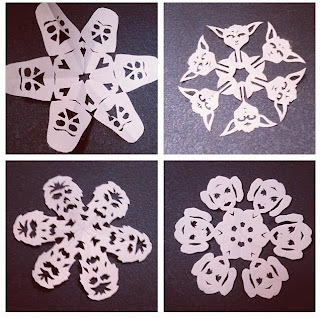 Those Star Wars snowflakes are awesome!!! Love seeing pictures of the grandkids. Keep warm! I followed the link to the Star Wars snowflakes, and spent a couple hours cutting out a few. I hung them in my 19-year-old son's bedroom, dangling from the ceiling fan. When he came home from work and saw them, I got a very gratifying whoop of surprise and delight! It sure sounds funny when our CA weather reporters try to make their stories sound significant! But really, it's cold! Chocolate mice . . . love it. How fun to bake with grandkids. Merry Christmas Cindy.